There seems to be a growing trend these days for the millionaires and billionaires of the world not to pass on their wealth to their children but to instead give away their huge wealth in a philanthropic effort. While this is very admirable it does throw up an interesting question, how would you feel if you were the child of one of these rich people? A child who would have otherwise been the recipient of this immense wealth? The reason I bring this question up is that I was watching a television program last night which referenced a millionaire who did just that. 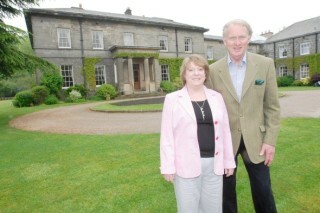 In 2009 Brian Burnie – who made his millions in petro chemicals and recruitment – decided to sell his £16 million Mansion in Northumberland and funnel all of his wealth into a new charity ‘Daft as a Brush Cancer Care’. Now I don’t want to delve too deeply into his reasons for doing this in this post but if you want to know more about why he did it then you can check out this news article. Instead I wanted to talk about another element of this story which interested me and it came up when the makers of the program interviewed Brian’s Daughter. First of all let’s mention here that it appears that Brian’s decision to give away all of his wealth seems to have caused him some huge family issues, including contributing to the break-up of his marriage. When listening to his daughter speak about her feelings on her father’s decision to give away all his wealth, it seemed that she wasn’t all too happy about it and this got me to thinking, how would you or I feel if we were in this position? Let’s just imagine that you had grown up living quite a luxurious and extravagant lifestyle. You had never had to want for anything and you were pretty certain that money was never going to be a problem for you in the future. Then one day your father asks you to type up a press release stating that he was going to be giving away all of his wealth and this was the first that you had heard of it – did I mention that Brian didn’t consult his family about his decision? How would you feel about this noble gesture? Would you be happy and in awe at your fathers fabulous show of generosity, or would you be angry that you were not going to receive a penny of the wealth which you had always expected would be passed on to you and your siblings? Especially when you find that within the space of 2 or 3 years you have gone from living in a £16 million mansion, to now having to pay a mortgage like everybody else and surviving on a standard teacher’s salary? I understand that there are many reasons why wealthy parents may decide to take a decision like this, wanting your kids to make their own way in life and desiring to use your wealth in the best possible way being just two. In the same vein though you can understand why on some level this might be a bitter pill to swallow for the family of somebody making this decision, especially if they were not even consulted and were not in agreement with the decision. I feel like I may be coming across as though I disagree with what Brian did in this post, but that’s not true. I really, really admire it. It’s just that when you see that his decision caused the breakup of his family and also placed a strain on his relationship with his children then it really made me wonder how I would feel if I were in this position, the position of the potential heir or even of the on-looking reluctant spouse. It kind of adds weight to the phrase ‘More Money, More Problems’, doesn’t it? Would You Be Happier If You Gave It All Up? Should parents be fined for taking their kids on holiday during term? How Do More Than a Billion People Live on a Dollar a Day? Can Money Buy You Happiness After All? At risk of sounding incredibly harsh, I don’t think the kids should actually have any say in it. I’m not saying I agree with this guy not telling his family about his plans- each to their own. What I am saying is that I don’t think children should expect an inheritance, full stop. I know a lot of people will disagree with me and think I’m a terrible person for saying it, but I think it makes you a more rounded person if you’ve worked for what you’ve got. Also, major respect for giving all of the money in the first place. Yeah you’re right Reece, he does deserve a lot of respect. It is weird how attitudes have changed over the past few years though isn’t it. In the past it seemed that the reason people were working so hard was to be able to set their kids up for a solid financial future, nowadays it doesn’t seem to be that way. Although I am in favor of making your kids work and earn their living, I also understand why the kids would be upset if all their lives they thought they didn’t have to do anything to make that money. I don’t really blame the kids, well yes they are probably a bratty bunch, but I blame mostly the parents for spoiling them. If the millionaire above explained to his child from an early age that she should expect an inheritance and she didn’t do anything for herself then she shouldn’t be upset when he did what he did. But you have to admit that he went about it the wrong way. It is the same if you tell your wife to stay home with the kids and you’ll take care of everything and then 20 years later you leave and she now she has to find work after not working for 20 years. I bet she would be pretty upset too. I like the example you used there Aldo and I agree, it would be a good idea to prepare your kids from an early age if you have plans to do something like this. Although I’d be among the first to say that parents have the right to do whatever they want with their own money, I admit quite freely that I’d be upset if mine gave away all their money without leaving me anything. If parent’s idea behind this is to teach their children to get by on their own, well….I already have. My husband and I bought our own homes, put out son through college, financed our own lifestyle and retired early. We have proven that we can do it on our own. But receiving an inheritance insures that our later life will be economically secure for as long as we live. Even Warren Buffet’s kids have received a start from their dad. One works for his foundation and draws a good salary from that. Another manages a huge farm in central Illinois owned by the foundation and receives income from that. I believe the third child works for Buffet’s investment firm and gets income from that. So in spite of his grandiose announcement about giving away all of his wealth, even he has provided his heirs with something. Thanks for mentioning those points about Buffet Kathy, I really didn’t know that. We didn’t have a lot growing up and I have to admit I was always a little jealous of those around me that seemed to get a financial leg up. Things have turned out well in the end but it could have been a lot easier I have to say. This is a tough one. If my parents raised me and “spoiled” me along the way (meaning I didn’t have to get a job, etc.) then I would be mad that I wasn’t getting any of the family money. But, if they made it clear that I needed to make a life for myself, then I understand. After all, it is the parents money and not the kids. The old saying of when you assume you make an a– out of you and me rings true here. Don’t assume you are getting a great inheritance. If you do great, but you shouldn’t expect something that may never materialize. It’s like the people that spend the tax refund before they get it. If the refund is less than what they expected, they find themselves in debt. I agree with the other comments as well. It truly is up to the parents because it is their money, but obviously the kids would be upset because they rather have the fortune than giving it to someone else. If they have pots of money saved up, and the money is given in a Will rather than before death, then they may be able to challnge it under the Inheritance (Provision for Family and Dependants) Act 1975. In essence, if they have been provided for during his life, the Courts may decide that it is unfair to pull the rug entirely on death. However, the costs can easily top £80,000 and one recent case is rumoured to have cost over £1m. If the claim is considered unreasonable, the judge could make you pay both your costs and the other sides, so don’t start such an action without sound legal advice which you actually LISTEN too. Many of these cases are started in a fit of pique with no realistic prospect of success!